Task: to design a toy car in a given style. Tobeus is a project by Italian designer Matteo Ragni who wanted to create a toy made of natural wood that would be an endless source of imagination for children and adults. In 2008, Ragni produced five Tobeus cars and soon dozens of designers joined him coming up with their own models and displaying them at the 100% TobeUs: 100 Designers for 100 New Toy Cars exhibition that travels the world. Each time the exhibition comes to a new city, ten local designers create ten new toy cars. During the seven years of its existence, the exhibition has been to Milan, Toronto, New York, Bolzano, Berlin. In June 2015 it came to Moscow. Mashinkus was created at the studio specially for the Moscow Tobeus exhibition. 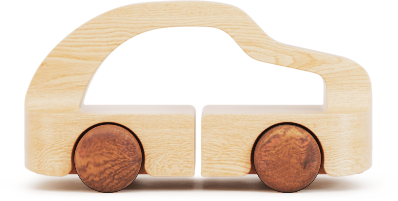 Tobeus toy cars are made of Lebanese cedar, which is both light and strong, pleasant to the touch, has a distinct smell and ages beautifully.